There has been a large increase in the commercial use of integrated crop/pest management methods for pest and disease control on a wide range of crops throughout the world since the first edition of this book. 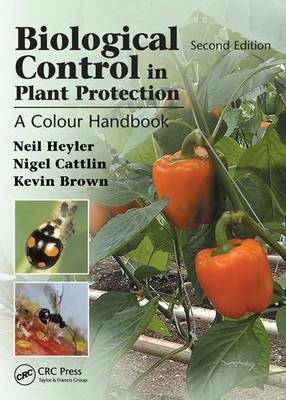 The completely revised second edition of the bestselling Biological Control in Plant Protection: A Color Handbook continues the objective of providing a handbook with profiles and full-color photographs of as many examples of biological control organisms from as wide a global area as possible. It is designed to help readers anticipate and recognize specific problems of pest management and then resolve them using the natural enemies of pests-parasites, predators, and pathogens. The authors first describe the impact of predator-prey relationships on host plant species in arable, orchard, and protected environments. The main sections of the book include profiles of pests, beneficial arthropods (insects and mites), and beneficial pathogens (bacteria, fungi, viruses, and nematodes), featuring a tabular pest identification guide. Descriptions of biocontrol organisms are divided into four sections: species characteristics, lifecycle, crop/pest associations, and influences of growing practices. The text is illustrated throughout with color photographs of the highest quality. This revised edition helps readers more fully understand the concepts and practice of biological control and integrated pest management. All chapters have been updated and expanded, and more than 300 new photographs have been added. The second edition covers new beneficial organisms and pest profiles, and it includes a new chapter on the practical aspects and application of biological control. It also contains a new final chapter that puts biological control in perspective, discussing interactions that occur when using biocontrol for population management as well as some of the possible mechanisms of biocontrol. ...high quality photographs and accurate information... a practical guide for gardeners and a textbook for students studying applied entomology...will also be appreciated by naturalists.